The common consumer theory portrays the individual as a homo economicus, who selfishly maximizes his utility. However, the authors of the book Das materielle und kulturelle Lebensniveau des Volkes und seine Planung (an acquisition bought from Hoblank24 in Berlin) describe the individual as a homo politicus. This column discusses several aspects of their alternative view. Also it is once more argued that the cardinality of utility is essential for an understanding of the economic phenomena. Several applications with empirical models underline the power of cardinality. At the end of the nineteenth century the Austrian School developed a consumer theory, which views man as a homo economicus. The homo economicus, or in plain English the calculating citizen, wants to satisfy his needs as much as possible, and he pursues this aim in a rational manner1. He is able to compare his needs, and to determine their satisfaction, given a real or hypothetical situation. This judgement allows him to formulate preferences. He strives for transactions, that have more benefits than costs. 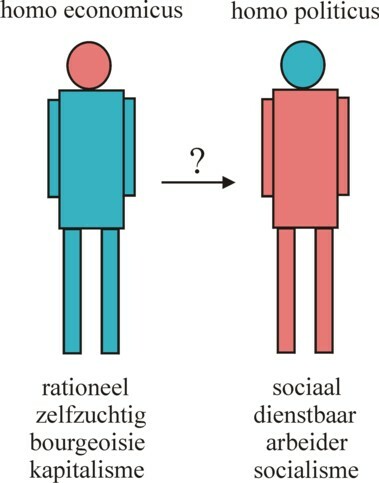 The homo economicus is a stereotype, which founds his decisions on rationality and self-interest. Often this is called the theory of the household, because in the economic science the household is a convenient unit. Moreover, the units or subjects do not only consume, but they are also suppliers, notably of the production factors labour and capital. The suppliers give an income to the households. The decisions to buy goods and services are naturally tied to the income, that can be acquired. In a previous column about the disutility of labour the amount of labour time, that is offered by the household or the individual, has been studied. The notion of man as a homo economicus has a long history. Apparently she began when in 1705 Bernard de Mandeville published his Fable of the bees2. Better known is Jeremy Bentham, who in 1780 stated that "There is no truth interest but the individual interest". Nevertheless it may be concluded, that the human needs are to a large degree determined by the social conditions. A popular find, originating from the American psychologist Abraham Maslow, is the so-called pyramid of needs. It is presented in the figure 13. The needs begin with the physical necessities, such as housing and sufficient alimentation. On a higher level they require a secure future, and next an agreable social environment. At the highest level is the desire for the freedom to arrange one's own life according one's preferences. The pyramid shows, that the human interaction and valuation are indispensable for a satisfactory life. The consequence is, that the individual can not be purely selfish, but must always take into account the needs of others. In other words, the important others are included as a part of one' egoism. According to the circumstances this can be a selected group, or a significant part of humanity. In a previous column it has been explained how the Leninist economist Belousov orders the needs according to the group interests. They are combined and harmonized in the general interest. In another column his colleague Val'tukh determines the needs from the historical and social developments. The present column will add several interesting insights from the book Das materielle und kulturelle Lebensniveau des Volkes und seine Planung4. In essence the editors of the book, the Leninist economists Graf and Manz, follow the arguments of Belousov and Val'tukh. They even cite from the works of Val'tukh, although unfortunately his model of indifference curves is not mentioned. An interesting phenomenon is the concept of the socialist personality, which forms the foundation of the book. This stereotype of an arbiter attaches much value to the general interest, and tries to further and strenghten it in his actions. He acts in accordance with the social expectations. In the western literature this vision of man is called the homo politicus. Graf and Manz even give it a class character, where the homo politicus is the common type among the workers and office staff. In their eyes the calculating homo economicus represents the bourgeoisie, consisting of entrepreneurs and rentiers. Thanks to the rise of the popular democracies at the beginning of the twentieth century the homo politicus has gained a large influence on the social developments. A new conscious develops, that recognizes the large need for social, collective goods. At the same time Graf and Manz stress, that the homo politicus is never present in its pure form. Individuals always continue to include material considerations in their decisions. Thus the two possible visions of man in the economical debate have the forms, which are sketched in the figure 2. It is worth elaborating on this - and this is what Graf and Manz do. The debate about the two visions of man is not moral or ethical, but purely economical. The neoclassical economists believe, that the homo economicus will always dominate the society. However, the Leninist economists argue, that the shifting balance of power will change the conscience. The humans change from a homo economicus in capitalism to a homo politicus in socialism5. Each type of society requires a corresponding attitude. Here one recognizes the approach of the Historical School, which interprets the regional popular disposition and the technical state of the art as pillars in the economical system. It is obvious that Graf and Manz expect a large variety of socialist systems in the future. According to Graf and Manz the mission of the modern state is fixed by the economic constitution. They formulate this law as follows: The production must serve the continuous satisfaction of the increasing material and cultural needs of the people. This requires the continuous development and perfection of the production, both by intensifying its techniques and by controlling the scientific-technical progress. Here the cultural needs refer to the mental and ideological development, which is satisfied mainly by offering services. They are located in the upper layers of the pyramid of Maslow, and belong to the field of ethics, morals and aesthetics. So the centre of gravity of the consumption will shift from material goods towards all kinds of individual and social services. The vision of Graf and Manz with regard to the meaning of labour for the individual is surprising. They argue, that labour gives the highest meaning to life6. In the labour most of the interhuman relationships develop. Although labour is never free from inconvenience, it is after all a source of pleasure and creativity. This is in fact a denial of the disutility of labour, which has just been mentioned, and which is prominently present in the writings of for instance Gossen and Jevons, and in their footsteps Sam de Wolff. When labour is satisfying, then the individuals will even be willing to abandon other pleasures in favour of work. Indeed this is precisely, what happens according to Graf and Manz7. In the society of the homo politicus the production of profit is no longer the ultimate goal. A labour of good quality is more important than the maximization of the investment. The increase of the pleasure of labour coincides with the deepening of the solidarity between the individuals. This standpoint reminds of the ideas in the writings of De Man, Deppe, and Sie Dhian Ho, which have been summarized in a previous column. These three thinkers support the vision of the historically growing man, although they prefer to interpret this a an evolutionary process with an open ending. They do believe in predestination, contrary to Leninism8. The three prefer to describe the society as a mixed economy, and not as a struggle between capitalism and socialism. Your columnist is willing to reject an excessive work stress. Yet this choice is double-edged, because she slows down the growth of the productivity. The individual must be willing to exchange welfare in favour of more well-being. Besides, there is the hope, that in the long run more room for development, formation and education will produce more productive people. And a lower work stress could further the health, so that people remain productive for a long time, with little additional costs. Perhaps the loyal reader has noticed, that sometimes on this portal the writing of texts is accompanied by a growing insight of your columnist. Then a later column returns to the previous argument, in order to add useful comments. This uis also the case in the present paragraph, which adds some remarks to the column about the cardinality of the marginal utility. For a good understanding is is desirable to read both columns at the same time. In the formula 1 ln(.) is the mathematical function of the natural logarithm, x is the quantity of consumed product, y is the income, and the ci are empirical constants. Thus for instance a large household will buy more food than a small household with the same income. One recognizes in the formula 1 the empirical relations, which have been used by Van Praag and Ferrer-i-Carbonell in their studies10. Other expressions for this elasticity coefficient are ε = ∂(ln(x))/∂(ln(y)), and ε = (Δx / x) / (Δy / y). 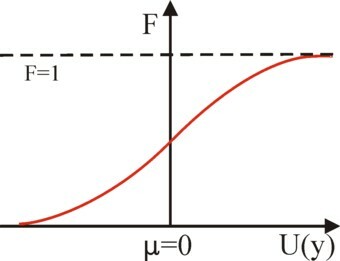 The first expressions shows, that a functional relation such as the formula 1 assumes a constant elasticity coefficient. Often this is indeed the case, at least within a reasonable approximation. That is convenient. The second expression is written in the form of differences. Here it can be seen, that individuals think in terms of relative changes Δx/x and Δy/y, and not in terms of the absolute changes Δx and Δy. In the formula 3 the integral is simply a method to aggregate all households, starting at the lowest incomes with the lowest psychical income (utility) U. The symbol -∞, which is the lowest integration value, represents a negative infinity. Here the integrand ν has a normal distribution (Gauss curve) with a variance (width) of σ². Note that the integration of U(y) and y up to ∞ (positive infinity) results in F=1. The function F(y) is in fact the aggregated probability distribution. The value of F is the fraction of the total number of households. The figure 3 displays her characteristics in a graphical manner. It is true that U(y) is unbounded for high values of y, but the probability of an exorbitant income is minimal. In the formula 4 one has μ = E(ln(y)), that is to say, the logarithm of the income, that represents the gravity point of the utility distribution. Although the similarity between the formulas 3 and 4 is striking, these two aggregated quantities have a completely different meaning. In the formula 4 the Gauss expression in the integral corresponds to the functional behaviour of the marginal utility ∂Uj / ∂(ln(y)). Therefore the integration does not pertain to the utility, but to all incomes below y. It is obvious that this is merely possible for the cardinal interpretation of utility functions. When in a graph the integral of the formula 4 is drawn as a function of ln(y), then naturally one finds again the formula 3. Actually the formulas 3 and 4 are counterparts. The first one is the fraction of the population, the second one is the utility of the individual. The first one integrates the (psychical) income distribution of the utility, the second one integrates the (marginal) utility distribution with respect to the income. Perhaps the reader is not surprised, that your columnist required several nights of sleep in order to understand these differences. This is remarkable, considering how for instance the Leninist economist Val'tukh opposes the idea of the marginal utility for a single good in isolation. Van Praag also makes the interesting remark, that the cardinal concept of utility is indispensable for the determination of income inequality (see Van der Wijk! ), in the theory of taxes, in the analysis of intertemporal behaviour such as consumption and saving, in the theory of investments, or for taking a decision under uncertainty. Now as an illustration a short elaboration will be given about the last field of research, namely the choice between uncertain alternatives. Usually this theme is not addressed in the introductory textbooks about micro-economics, although such situations occur often. Here the need for cardinality becomes obvious. Consider an individual, who reflects upon the participation in a transaction with an uncertain outcome. In the theory this rather common situation is given the sensation-hungry designation lottery. The integration runs over all occurring values of xj. The mathematical similarity of the formula 6 with the formula 4 is striking. However, both formulas aggregate different variables, namely respectively the utility and the marginal utility. In the formula 6 the utility is weighted with the chance of realization. So f×U can be interpreted as a depreciation of the utility, because of its uncertainty. Another way to write the formula 6 is UV,j = ∫ U dF, where F is the primitive function of f.
Thus the formula could be applied to the theory of Van der Wijk. Suppose that someone has the option to emigrate to another society, and he wants to know what his expected utility will be there. The formula 6 allows him to calculate that, namely by the insertion of F of the formula 3. The result is somewhat insipid, namely UV,j = E(U(y)) = E(ln(y − m) / c) = 0. It is most likely that he will receive the average psychical income, which is zero. This application of the formula 3 underlines again the difference with the (marginal) utility formula 4. With this funny example the present paragraph is closed. This paragraph describes the results of a study of the subjective income inequality, and is copied from the stirring book Happiness quantified15. The study does not use the spread of the incomes in order to determine the social inequality, but the spread of the utility of those incomes. It is worth noting, that also Jacob van der Wijk studies the income inequality, simply by determining the variance σ² of the utility distribution in the formula 3 in an empirical manner. But Van Praag and Ferrer-i-Carbonell dispose of much better data sets, with lots of information about the situation of the separate households. Moreover they obtain the value of the utility from the individuals themselves, and not from an analytical formula. That considerably enhances the credibility. The utility of an income can be determined by asking the households with regard to their satisfaction about their own income. This is the so-called financial satisfaction question. Next the variance of the utility distribution can be calculated for the whole society, from the spread in the satisfaction. Indeed Van Praag and Ferrer-i-Carbonell use this approach, by means of the data from the German socio-economic panel (GSOEP) data bank, and they propose to employ that variance as the measure for inequality. They call it the subjective income inequality concept. That subjective inequality depends on several additional factors of influence, besides the size of the income, such as the size g of the family. The reader can consult the conclusions in chapter 13 of the book. It is an impressive illustration of the fruifulness of this kind of studies. An even better insight is obtained by asking each household about the utility of six different incomes (the so-called income evaluation question). The answers can be used to determine the utility distribution of the household j with regard to the size of the income. Van Praag and Ferrer-i-Carbonell assume that the distribution is log-normal, in agreement with the formula 4, and for the sake of convenience they suppose that the utility distributions of all households have the same variance σh². Thus they find for a household j the gravity point μj of its utility distribution with respect to the income. 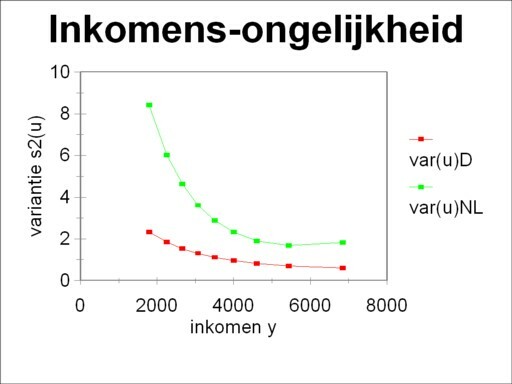 The true income distribution of the (German) society herself is also log-normal (according to the law of Gibrat-van der Wijk! ), so that also from this an average μ and a variance σ² can be computed. Thus for each household j there are two relevant distributions: the true social income distribution, and the distribution of the utility, which the household j attaches to incomes. Van Praag and Ferrer-i-Carbonell combine these two distributions in a total measure σu² of the spread, and use it as the measure for the subjective inequality16. The figure 4 shows how the subjective income inequality σu² varies as a function of the monthly household income. Apparently the inequality is experienced less, according as the individual disposes of a higher income17. In addition to the German GSOEP results (from 1997) the authors also give the results of an older Dutch study, dating from 1971. The trend is the same, but the Dutch values are approximately three times larger, in the absolute sense. Perhaps this is not surprising, since at that time the ambition for equality were high18. Anyway, it can be concluded, that the acceptance of cardinality in the utility research is fruitful for studies concerning the social (un)desirabilities.